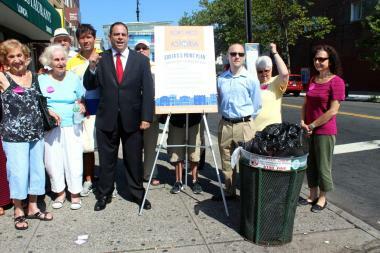 City Council hopeful Costa Constantinides and community leaders at press conference on July 15, 2013, where he outlined a plan to deal with garbage and litter in Astoria. ASTORIA — City Council hopeful Costa Constantinides is pledging to clean up Astoria's trash problem. The Democratic district leader, one of several candidates vying for the City Council seat held by term-limited Peter Vallone Jr., says he has a "five point" plan to battle litter and overflowing trash cans in Astoria — including a pledge to push for more frequent trash pickups and to hire street cleaning crews. "We get so many complaints," Constantinides said at a press conference earlier this week, where he laid out his plan for a cleaner Astoria. "Everywhere I turn, all I keep hearing from folks is, 'How are you going to clean up the garbage?'" Constantinides said his plan includes doubling the number of Department of Sanitation pickups for trash cans on the street in the neighborhood, which are often overflowing, and increasing fines for residents who are caught illegally dumping their household garbage in public cans. Paul Milholland, the pastor at Trinity Lutheran Church on 37th Avenue and 31st Street, said unsightly garbage is a problem in the neighborhood — a fact he's keenly aware of when the church has visitors from other parts of the city. "It's embarrassing to me to see them walk up Broadway, walk up 30th Avenue, and see the garbage. It's terrible," he said. Constantinides also said that if he's elected, he would use his City Council member item funds to improve sanitation at the neighborhood's many parks, start a graffiti deterrence and removal program, and hire street cleaning crews like the Doe Fund to maintain busy commercial streets. He said he would also secure city funding to add more garbage cans on streets that currently have none — an issue residents have complained about in the past. "We're going to find the money," Constantinides said. "Budgets are about priorities." Constantinides is one of several candidates in the running for Astoria's City Council seat in this fall's election, and is leading the pack in terms of fundraising, according to the city's most recent campaign filings. Records show he's raised more than $130,000, compared to the next closest candidate, fellow Democrat Costantinos “Gus” Prentzas, a member of Community Board 1, who has raised $25,345, records show. Astoria lawyer John Ciafone is also planning to run on the Democratic ticket. Other candidates include Danielle DeStefano, a high school volleyball coach who is running as an independent and has raised $7,021, campaign filings show. Green Party candidate Lynne Serpe, a consultant for the Queens Library, has raised $6,538, and Republican Daniel Peterson has $4,666, records show.